This is a sample workflow of using the riboplot and ribocount programs which are part of the riboplot suite. Both these tools are available under "RiboSeq Analysis --> Riboplot" on RiboGalaxy. For this tutorial, sample data (NCBI GEO: GSE53693 ) from Bazzini et.al will be used. For each sample dataset above, the SRA files were downloaded using FileZilla, an FTP client and then converted individually to FASTQ format using the fastq-dump command. Finally, the FASTQ files were concatenated using the cat command. The FASTQ files were then uploaded to the RiboGalaxy FTP server and then uploaded to RiboGalaxy using the "Upload File" tool under "Get Data". The format was selected as fastqsanger. riboplot and ribocount require Ribo-Seq data to be aligned to a transcriptome using Bowtie version 1.
adaptor sequence (ATCTCGTATGCCGTCTTCTGCTTG) and then rRNA. 2. Align reads to a transcriptome. Upload a FASTA format file of the transcriptome. data as above for Ribo-Seq. Using the "Sort Data --> Sort BAM dataset" tool using the default sort by option. Ribo-Seq alignment file in BAM format - Select the sorted Ribo-Seq alignment file from step 4. 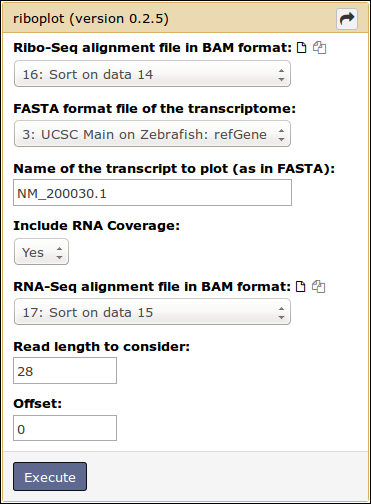 FASTA format file of the transcriptome - This is the transcriptome FASTA file obtained in step 2 or uploaded manually. Name of the transcript to plot (as in the FASTA and SAM/BAM). If RNA coverage is desired, select the 'Include RNA coverage' option and provide a sorted BAM file of RNA-Seq data. Input read lengths to consider. If 0 is input, all read lengths will be considered. An offset can be specified if necessary. 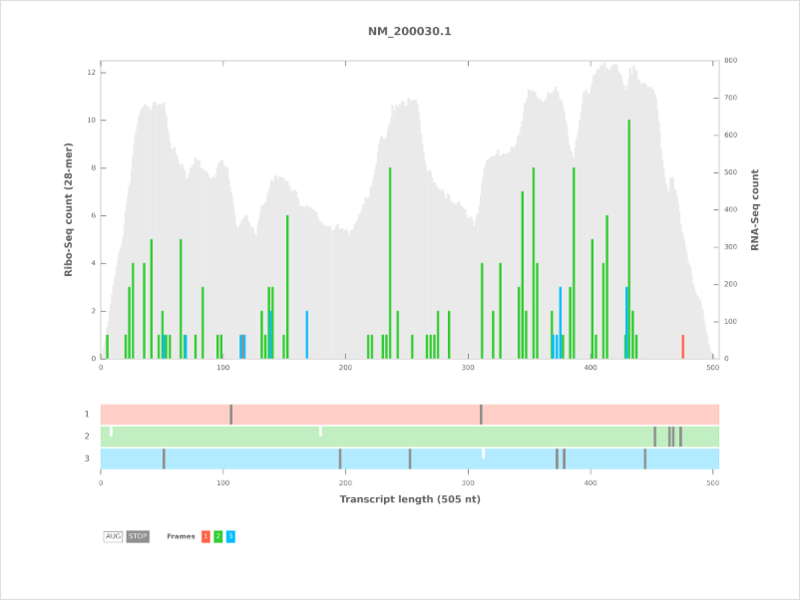 To output read counts for all transcripts in an alignment, select the ribocount tool from the RiboPlot suite (Figure 4). An offset can be specified if necessary. If this option is provided, this offset is added to the read alignment positions. 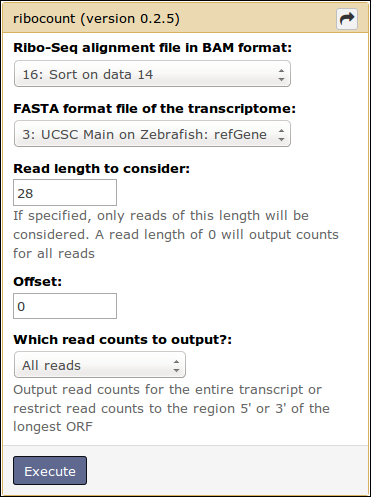 Choose whether to output read counts for the entire transcript or restrict read counts to the 5' or 3' region of the longest ORF. 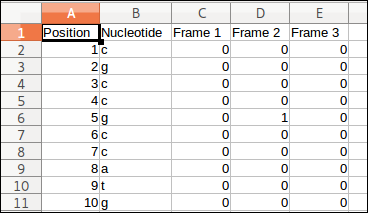 Default start (ATG) and stop codons ('TAG', 'TGA', 'TAA') are used to identify the longest ORF in 3 frames. As indicated, please download and extract the ribocount_output.zip file and open the index.html in a browser. the CSV file containing the read counts in 3 frames for each position in the transcript (Figure 6). Figure 6: HTML page with results of the ribocount run for all transcripts in an alignment. For additional information or questions, please refer to the RiboPlot documentation, the RiboGalaxy Help page or the Forums.